In an era of rising environmental awareness, it is necessary to provoke the society in order to change the way it perceives energy use. International practice Sériès et Sériès has been awarded second place for Greenoplasty – the design of Los Angeles Cleentech Corridor and Green District – their successful proposal offered inspiring environment, allowing its residents to look beyond the common and the easily consumed, in favor of the responsive, daring and stimulating. SES’s design has derived from strong belief that the urban planning has to propose radically new and more environmentally conscious way of living which further helps breaking old habits. 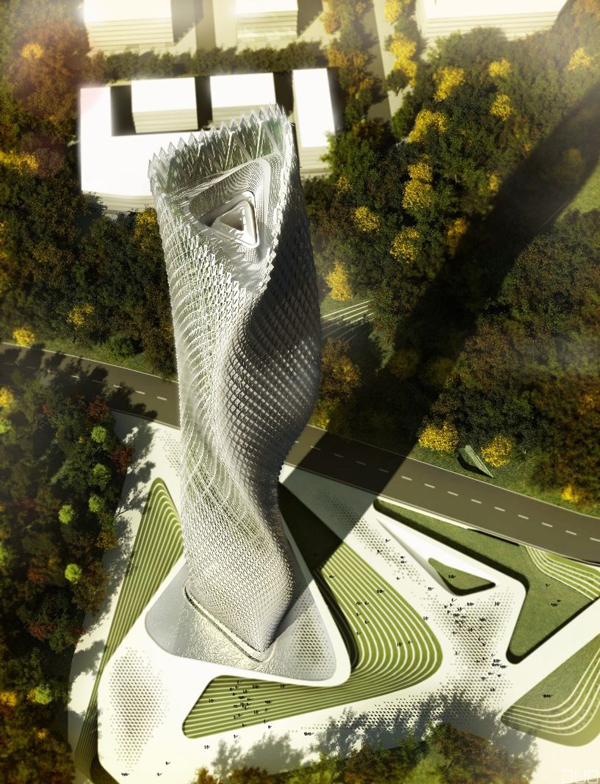 Elegant design of the Taiwanese Tower, designed by Decode Urbanism Office is derived from natural parameters of the wind combined with the characteristics of the base. Designed as landmark architecture, the tower stands out due to its uniqueness and progressive approach. 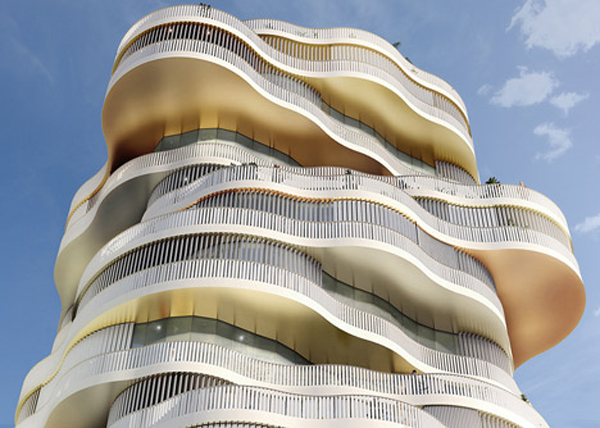 The façade of the high-rise is innovative – composed of multiple wind-driven generators supported by the structure. When the generator rotates, the façade changes along and the amount of produced energy is sufficient for the whole tower. The tower is a showcase acting as a proof that tells the natural password – wind energy can actually supply energy for the entire building. The diamond-type wind generator is fixed in the middle of a façade grid, with a net structure. The overall appearance of the façade is shown when the weather lane is parallel with vertical face. The shade of weather vane and structure makes shadow in the space of tower building, therefore controlling the entrance of light and reducing the consumption of energy. In case when the wind blows the veil of the tower, the weather vane is vertical to the façade and the structure becomes transparent. Due to the fact that the main purpose of Beijiao Sports Center in China, designed by Decode Urbanism Office, is to serve people and surrounding neighborhoods, it was of crucial importance to design it as a multi-functional and friendly, gathering place. The traditional concept and the image of the sport facility are abandoned, in favor to a vivid, active space full of energy night and day, both during sport events and after. The aim of the architects was to create a community space for higher social resilience. The divergent general layout creates a base and city with permeable interface between the site and the existing, surrounding urban context, and activity venues of various sizes are formed. Created spaces differ in height; therefore allow the host wide range of outdoor activities. 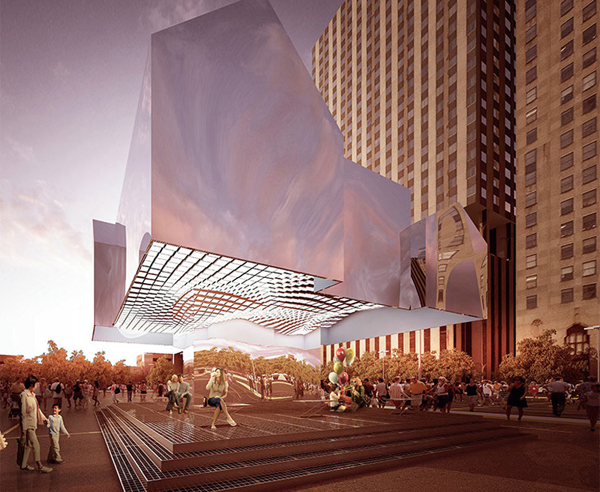 Flint Public Art Project and Flint Chapter of the American Institute of Architects have recently announced winners of Flat Lot Competition. 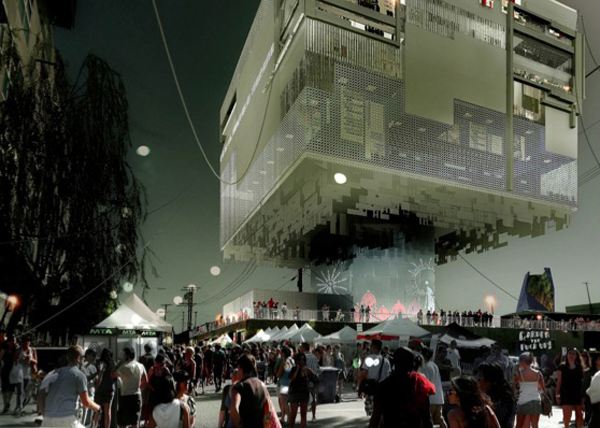 Two Islands – team of architects and designers based in London won the $25,000 grand prize and will design and build temporary summer pavilion on Flint’s central downtown parking lot. The project opens June 14 for Flint Art Walk and will remain on the site in Michigan until fall. The competition was launched last fall and it called for a temporary structure that would support public programs by providing amenities such as seating, shade, cooling devices, and a stage for performances, taking up no more than eight parking spaces. 221 entries were submitted by the March 1 deadline. 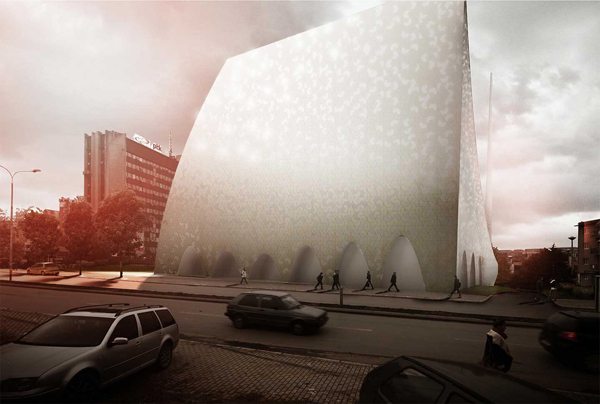 The jury for the international competition for Prishtina Central Mosque failed to agree on a clear first prize winner; however it seems that some of the un-awarded entries caught the attention as well. MI’RAJ is the proposal of APTUM, Swiss / American architectural practice, named by one of two parts of the night ascension journey that the Islamic prophet Muhammad took one night. 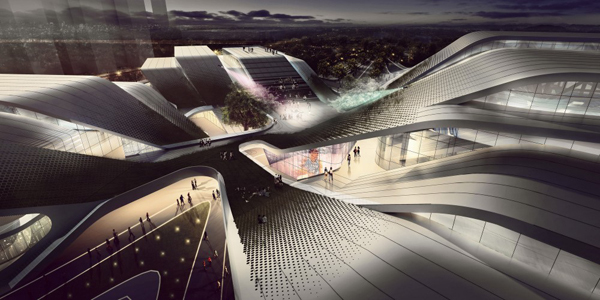 The proposal materializes the journey of ascension to prayer and the spatial experience that follows. Islamic community of Prishtina was searching for a unifying symbol and identity that can bring together many disparate mosques of Kosovo capital, APTUM’s design harnesses that need and brings together a sense of place and provides public space for the greater good of the community. London firm Farshid Moussavi Architecture has won a competition to design an apartment block in Montpellier, Southern France. Les Jardins de la Lironde in Montpellier is residential complex of elegant homes on the outskirts of the city – Les Folies Montpellieraines as eighteenth century bourgeoisie called it. 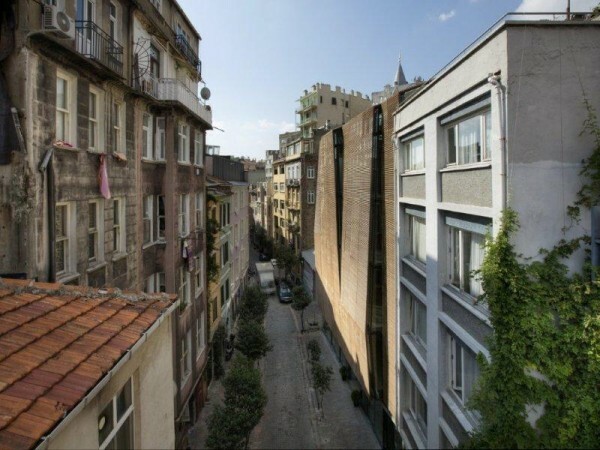 The building is located on Tatarbeyi Sokak, is one of the most virginal and underdeveloped streets of the rapidly transforming Galata District under conservation. Comprised of eight 80-m2 studio flats and one 190-m2 penthouse up for sale, it has a total surface area of 1000 m2. The building is a residential project that extends beyond the conventional codes of the already-built environment, yet manages to reproduce these codes, respecting the existing architectural fabric. 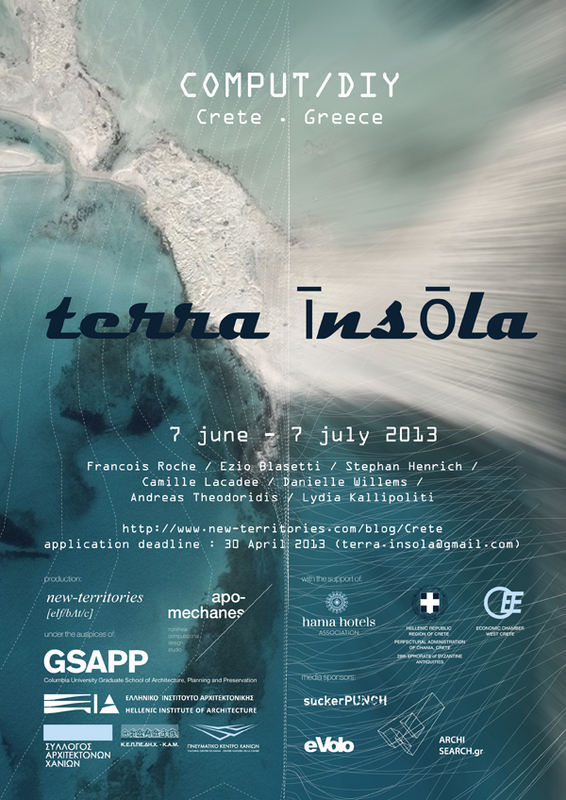 In this regard, it continues to find new solutions to the existing problems of architecture by utilizing contemporary technologies and taking into consideration the newly burgeoning socio-economic structure of the region, as well as the infrastructure, environmental conditions, climate, and solar movements. 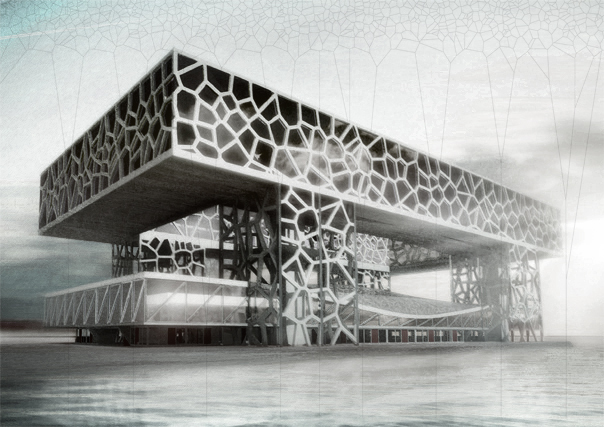 This project designed by Giacomo Pala is the result of the contrast between elaborately formal and incoherent shape and program: a detailed investigation of real specific housing problems in relation to the expansion of the city of tomorrow and the issues of globalization. The project is divided in two parts: the upper one is the housing block where 650 people can live. The second part of the building is the lower one which is composed by the public spaces. This part of the building is a 3 floors block (containing sports Clubs, Swimming Pools and gyms) defined by a dynamic shape and not directly connected to the housing part in order to maintain a diversification of the public, semipublic and private spaces. How can we look at the world today? How can we imagine a project for the future in a realistic way? We know now: Reality is not “Reality”. Reality is an Incoherent and dense mix of realities. It is a swarm which we generically call “reality”. 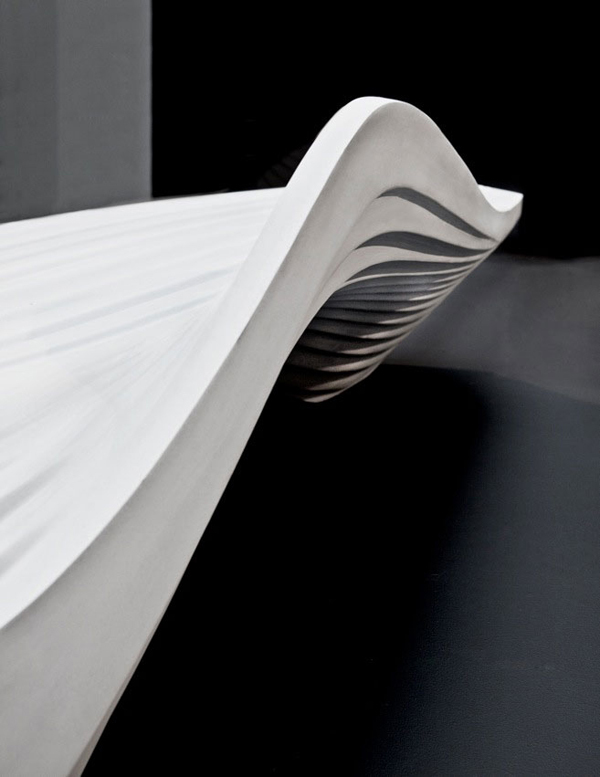 Zaha Hadid’s Serac bench is finally unveiled at this year Milan Design Week. It is created in collaboration with product designers and lanners at Lab 23 – a company known for its development philosophy and long standing activity in a direction of future technological developments. Graceful in its smoothness and fluidity, the bench is powerful piece of urban sculpture serving as urban furniture for seating and resting. Evoked by the image of a block of ice formed by intersecting crevasses in a glacier, the bench is made of hard-wearing resin quartz, a durable engineered stone. This specific material is chosen because of the perfection of its curvature when moulded. As a bonus, the surface of the bench has a sparkle from quartz component, therefore capturing light. The bench could be considered perfect example of beautiful synergy of form and material and their harmonious relationship.